What operating systems does VectorPort support? What types of input files does VectorPort read? What output ATE writers are supported by VectorPort? Do I need a license to run VectorPort? Yes, a license is required to open and process your pattern files. You can however install and run the fully operational software without a license file using demonstration mode. Test vectors can be opened and verified but ATE conversion and pattern creation are disabled without a license. Once you receive your license file, save it somewhere accessible on your computer. Next, download and install the latest version of VectorPort. 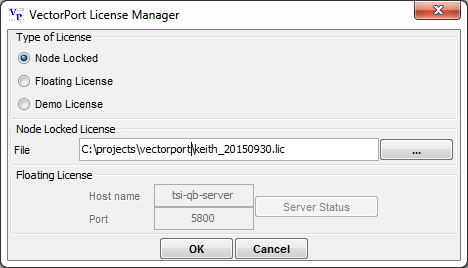 Once the install is complete, run VectorPort, then in the main window, under the Edit Menu, select ‘License Manager’. Select your type of license (Node Locked or Floating). For ‘Node Locked’, browse to the license file and hit OK. For floating licenses, enter the license server host name and port, then select OK. Use the ‘Server Status’ button to ensure the license manager can communicate with you license server. Once the license file has been validated VectorPort should be operational. Why does a Windows Command Tool pop up when I run VectorPort? 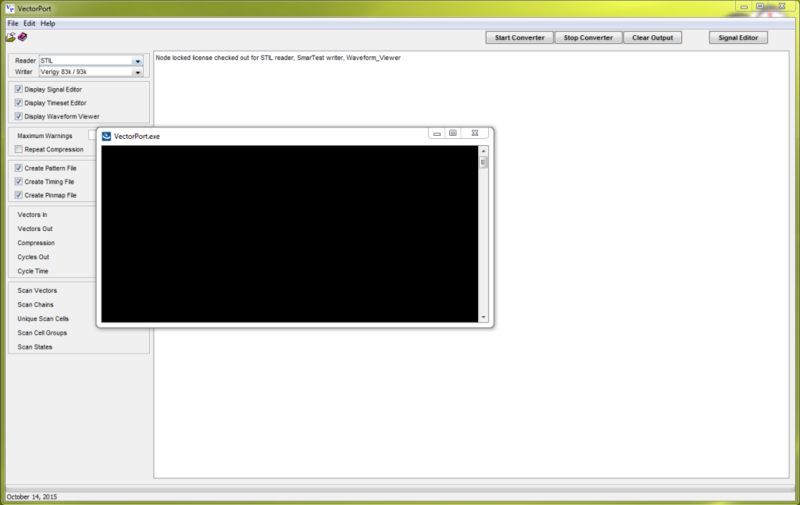 VectorPort allows for command line operation, without the need for the GUI. This can come in handy when processing large sets of test vectors using a script or batch-processing. The command tool is required so that arguments can be passed when using this methodology. Can I open several sets of vectors at the same time? Yes, select as many input vector files as needed using the mouse-click+Shift/Cntrl for selection. Only files of the same type can be selected at one time. How do I convert a set of vectors? Converting vectors is easy. First, select your input file type and the desired ATE output format. Next, set the Output Directory using the option under the Edit Menu. Select your test vector files using the Select Files menu or quick icon, and click the Start Converter button. Your pattern, timing, and pinmap files will be created in the output directory you selected. I converted a bunch of test vectors and I can’t find my patterns… where are they? All the selected output files, like test patterns, timing files and pinmaps are generated in the output directory. Specify the location of this directory using the menu option under Edit, Set Output Directory. What is the “Save Log File” option and why do I need it? You can save the processing information that occurs while converting your vectors to a log file. The information may be useful for documentation or tracking purposes as it contains data about the vector source, converter options, processing statistics, and more. What does Repeat Compression do? When converting test vectors to ATE patterns, enabling repeat compress will search for adjacent ATE pattern vectors that are equivalent and will represent them with a single instance of the ATE vector, along with a repeat count for the number of times the vector occurs. This conserves file space, aids with readability, and may use less vector memory (depending on target ATE). What do the Create Pattern File/Create Timing File/Create Pinmap File buttons do? Selecting the Create Pattern File enables the converter to change the input test vector states and formats into the equivalent state and format data for the selected ATE and saves the resulting state data as an ASCII pattern file with the appropriate file extension, depending on tester. The Create Timing File option will enable the creation of all timing information, such as edge locations, timing sets, and signal formats required to configure and operate the selected system. Selecting Create Pinmap File will generate a pin mapping file that includes information about the signal (pin) types as well as any signal groups or buses. The set of files are typical inputs required for creating a complete ATE test. What does the Signal Editor do? 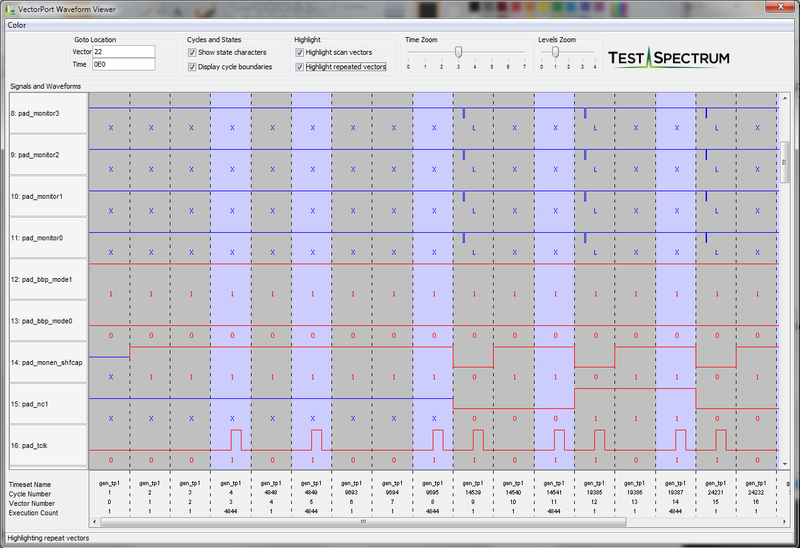 The Signal Editor is a graphical tool for modifying the device pins in your test vectors. You can remove signals, add new signals, and change the state of any signal to a static value (for the duration of the pattern). You can modify the signal names with operations such as find/replace or change the text to upper or lower case. 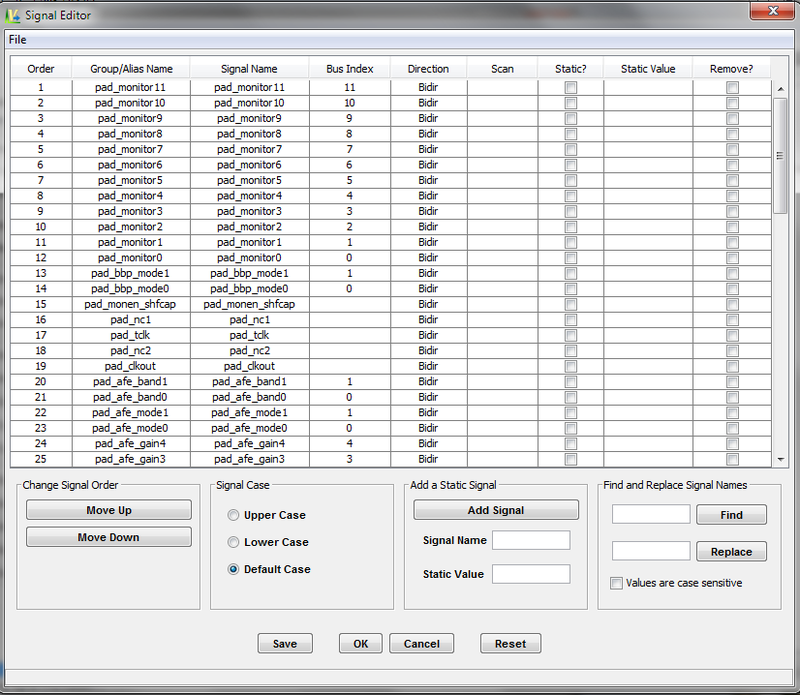 The column order of the signals and pins can be modified and groups can be created or deleted. Save and reload your signal edits at any time and share the settings across multiple patterns and projects. What does the Timeset Editor do? The Timeset Editor allows you to modify signal waveforms, timing edges, and formats using a graphical interface. 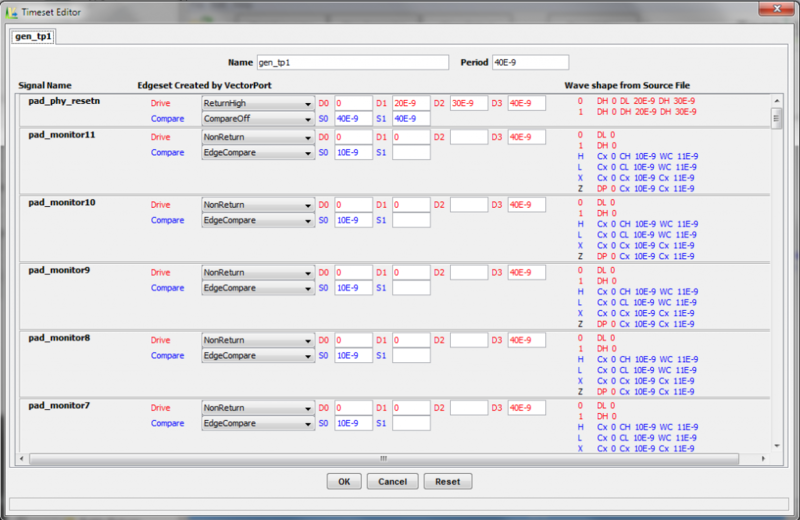 The timing requirements and restrictions for the selected ATE are represented with dropdown boxes for selecting alternate wave shapes and formats. Change the vector periods and edge locations for any of the time sets identified in the input vectors. The editor can also save and reload the modifications allowing timing parameters to be shared across multiple patterns and projects. What does the Waveform Viewer do? The Waveform Viewer allows you to visualize the signals and their timing in a logic-analyzer format. Zoom in or out to see vector and cycle numbers, time set allocation, state data and wave shapes for each of the signals found in the input vector files. Jump to an absolute vector or time and highlight scan vectors and repeat cycles. What does the “Maximum Warning” value do? In the case where there may be errors in the vector file, setting the maximum warning value allows the converter to automatically stop after a number of issues have occurred. This can be helpful when doing batch-mode processing and several patterns are being converted at once. What processing statistics are provided when processing vectors? Several useful statistics are calculated and maintained when processing test vectors. Items such as the number of input and output vectors, total cycle count, repeat compression ratio, number of scan vectors, chains, and more. I don’t see the tester I need on the list… what are my options? 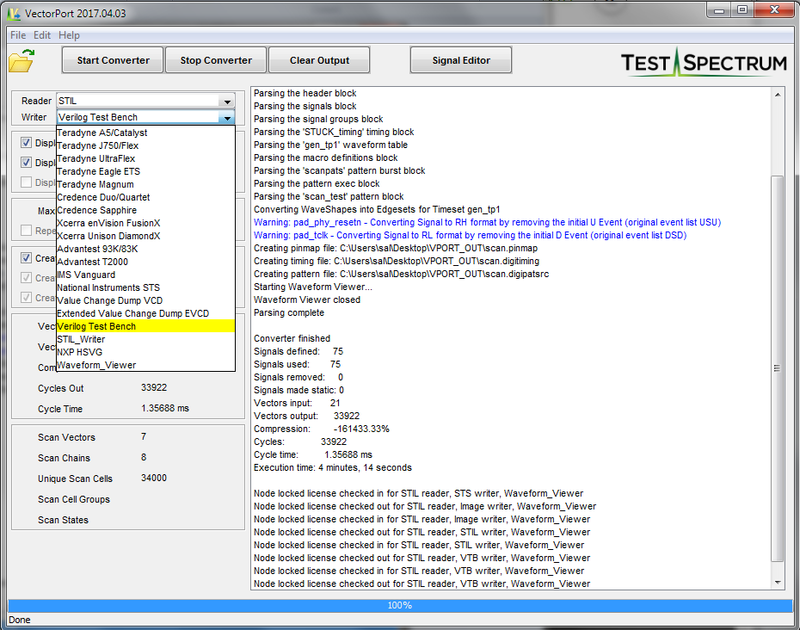 Contact Test Spectrum today and we’ll see what we can do to add your configuration to our growing list of converters. We are add converters regularly and are always looking to expand our library. What are the command line options and how do I use them? What other options are available when converting vectors? There are several options when converting vectors and there are different options for different ATE writers. Once the proper input file type and output writer have been selected, choose the Converter Options menu item under the Edit menu. Tester specific options will be presented near the top of the options page. Quick modifications to signals can also be setup using the options page. Modify or customize the output pattern states, scan chain configuration, timing properties and more. Can I change the state characters used by the output writer (globally change ‘H’ to ‘V’, ‘1’ to ‘Z’, etc)? Yes, you can create a fully custom mapping for your desired output states. For example, if you want to change every instance of a mid-band compare (M) to a don’t care (X), you can change output writer to apply X for every instance of M. This functionality and more can be found under the Edit menu on the Converter Options page. How do I add vector number/cycle number/cycle time comments to my patterns? Modify existing comments and add properties like vector and cycle information using the Convert Options page under the Edit menu. How can I improve the speed of VectorPort? If at all possible, use local disks for both input and output. Also, make sure there is enough free memory (default of 512M) otherwise swap space will be used which is much slower than normal memory. I want to automatically document all of my conversions. How can I do this? Enable the Automatically Save Log to File option in the File menu. How big of a file can I convert? 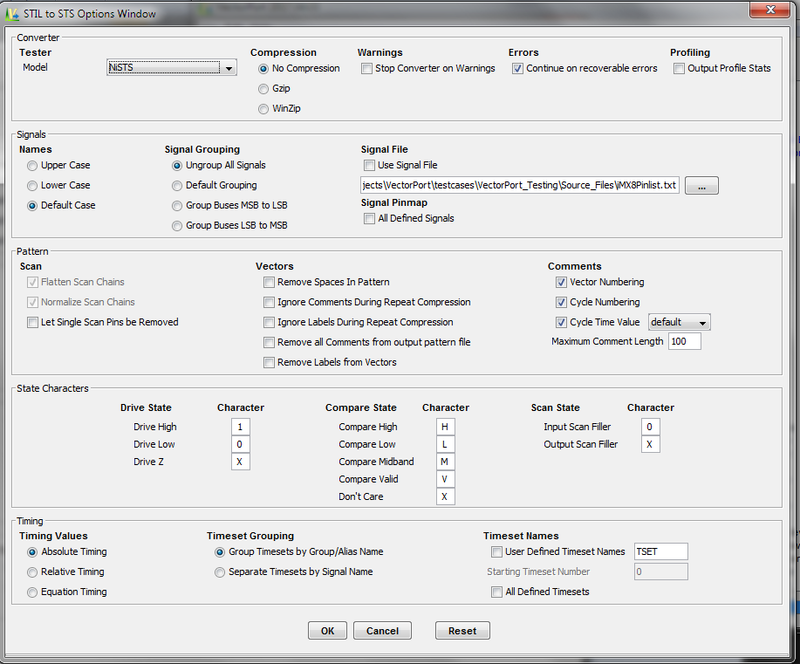 There are not any restrictions on the size of the input files that VectorPort can convert. Files in excess of 1.5G have been successfully converted by VectorPort. What can I do if I get an out of memory error? If you are running VectorPort on a 64 bit system, download and install the 64 bit version of VectorPort. If you are running on a 32 bit system, go to the directory where VectorPort was installed and locate the file ‘VectorPort.lax’. Open this file with a text editor and change line 71 from the default ‘lax.nl.java.option.java.heap.size.max=512000000’ to a larger number, such as ‘lax.nl.java.option.java.heap.size.max=750000000’. Note, most Windows machines will only allow a value up to 1250000000, while Linux and Solaris machines tend to allow a larger value. What is the Temp directory used for? Occasionally, temporary files are created during the conversion process. 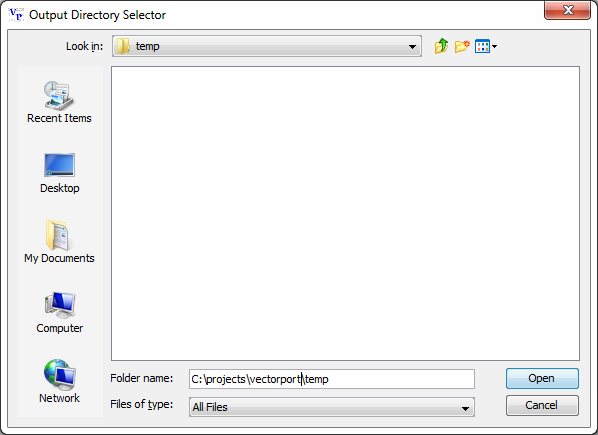 The Temp directory is where these files reside while VectorPort is active (they are deleted when VectorPort is exited). Why won’t my Teradyne Image scan pattern compile? If you’re scan pattern uses pin aliases, then it probably will not compile, due to a bug with Image. Replace the pin aliases with actual pin names and retry. I get the a ‘Reverse WGL Scan State Bit Order’ warning message, what does this mean? The warning message: “ WGL SCAN Block – If ‘Encounter’ ATPG tool was used to generate the input file, then user should select the ‘Reverse WGL Scan State Bit Order’ in the options menu”. This message is a generic message whenever any WGL scan pattern is converted. It means that if the input file chosen was generated by the ‘Encounter ATPG’ tool, you will need to use this option in order to get the correct output for your patterns. Encounter reverses the scan chain bits compared to other APTG tools like FastScan and Tetramax. I’ve got a feature request. Where should I send it? Send all requests to vectorport@testspectrum.com. I’ve found a bug with VectorPort. What should I do? Save the log file and include it as an attachment to vectorport@testspectrum.com.